We’d love your help. Let us know what’s wrong with this preview of Minotaur by Phillip W. Simpson. So begins the story of Asterion, later known as Minotaur, the supposed half bull creature of Greek “Where shall I start?” asked Minotaur. To ask other readers questions about Minotaur, please sign up. Eventually Asterion decides to tell Ovid that he is the infamous minotaur, still alive and living close to the labyrinth. At first Ovid is just humoring Asterion, allowing Asterion to tell his story... this is when the book really sta This is the true story of the minotaur. Ovid, a scholar who has written a huge volume of myths/legends, travels to the site of the minotaur's labyrinth. His tour guide Asterion, who is known as the minotaur, leads Ovid up the mountain and to the crumbling labyrinth. I love Greek mythology and I came to this retelling of the Minotaur with eager expectation. I wasn't disappointed. Using restrained 1st person narration, Asterion tells the story of his life to the poet Ovid. Simpson cleverly captures a sense of distance/detachment/perspective in Ast's voice. He's looking back 1000 years and while he suffered terribly, he has moved on. The telling is a ritual of putting the past to rest. We are given key events that establish Asterion's true nature, the contrast i I love Greek mythology and I came to this retelling of the Minotaur with eager expectation. I wasn't disappointed. We are given key events that establish Asterion's true nature, the contrast in this physical size/strength set against his gentleness and shyness. We see the foundation of cruelty and injustice inflicted by Minos. Theseus introduction sets the story humming. His recklessness, boldness and wrath work as a counterpoint to Asterion's caution, reluctance and mercy. Asterion's time in the Labyrinth was what I most looked forward to and I found this part of the story especially satisfying. The inclusion of Daedalus and Icarus's storyline had me rapt and all the clever details that went into creating the 'myth' of the fearsome Minotaur. I was very fortunate to have the author ask me to be a beta reader for this book. This book just had I was very fortunate to have the author ask me to be a beta reader for this book. This book just had it all!!! This book was all sorts of awesomeness!! I was immediately hooked from the first page and wasn't let go till I turned the last one, and even then it stayed in my thoughts for days. I love everything mythology based so was very eager to start this, and let me tell you, this was a fascinating take on the Minotaur myth. There isn't much I can say about the plot that isn't covered in the synopsis so I'll get straight to my thoughts. Asterion is an amazing character. He is born after King Minos kills This book was all sorts of awesomeness!! I was immediately hooked from the first page and wasn't let go till I turned the last one, and even then it stayed in my thoughts for days. that it is Poseidons punishment for what he did. Minos hates Ast and either ignores him or makes his life a misery. My heart broke so many times for what Ast went through!! It's already hard for him to have the horns but add in his fathers hatred and it's heartbreaking. The story that Ast tells Ovid had me glued to the pages. It almost felt like you are reading a true account of what happened, and who knows, maybe it is true ;) Ovid upon hearing the tale starts out skeptical but even he can tell that Ast speaks from the heart. He documents everything that he is told and the story unravels slowly. I loved how we go from the Minotaurs story to Ovids reaction every so often. I was so engrossed in the tale myself that it was nice to get a breather and just take it all in! There is so much happening in the story that you will devour this book. I was so sad to see it end because it's simply that good! The mythology of the Minotaur aside, we also have Poseidon, Daedalus and Icarus, forbidden love, brother bonds, action and adventure aplenty. It is everything a great book needs, and more!! I'm a Greek mythology nerd. A lot of people in this generation are Greek mythology dweebs because of the Percy Jackson (Shoutout to Rick Riordan!). This book was definitely enjoyable and the author does a good job of making the story interesting while weaving the history of the tale and Ovid into the story. It starts with Ovid arriving Crete, and quickly becoming introduced to his tour guide, Asterion, otherwise known as the Minot Thank you Andye from readingteen.net for the chance to review this! It starts with Ovid arriving Crete, and quickly becoming introduced to his tour guide, Asterion, otherwise known as the Minotaur. The rest of the story is Asterion telling Ovid about his past and all of the cringe-worthy ways he was mistreated, I swear, people are terrible. My fist wanted to come out to play many times. He was born with horns, so what, that just makes him like Danielle Radcliffe. The story was really unique and interesting, with a fresh change of perspective to the victim of this Greek epic. Mythology for the win!! This epic re-telling of the myth of Theseus and the Minotaur is told by Asterion the Minotaur himself. When he is visited by Ovid the playwright/poet Ast tells him the story of his life. Asterion tells Ovid about his childhood, living in the palace with his evil step father King Minos, his mother and his many brothers and sisters. You get to find out all about his adventures before and during the labyrinth. It was awesome to read what it was like in the labyrinth from the Minotaur's perspective. A This epic re-telling of the myth of Theseus and the Minotaur is told by Asterion the Minotaur himself. When he is visited by Ovid the playwright/poet Ast tells him the story of his life. It was awesome to read what it was like in the labyrinth from the Minotaur's perspective. Asterion is a great character and you really get to feel his pain. (Poor Ast). Month9books sent me a review copy of these amongst others and I knew I had to read it straight away. As a lover of Greek Mythology and having spent my adolescent reading the Percy Jackson series, I knew that I needed my fix and boy did this do it! If you know, not only your Greek Mythology but also your Roman philosophers then it'll be perfect for you. Minotaur adds a new layer to the story that we learn when we study the ancient world and creates empathy to the once feared creature. The charact Month9books sent me a review copy of these amongst others and I knew I had to read it straight away. As a lover of Greek Mythology and having spent my adolescent reading the Percy Jackson series, I knew that I needed my fix and boy did this do it! If you know, not only your Greek Mythology but also your Roman philosophers then it'll be perfect for you. The characters come off the page fully formed and I instantly began to love and loathe certain characters. Greek myths aren’t just for scholars, and Phillip Simpson’s Minotaur isn’t just for kids. But this is a cool reimagining and vivid retelling of a young man’s coming of age in the time of legend. Heroes are human (but strong), and monsters… well, this monster at least is mostly human as well. Gods might make better fathers than some men. And relationships, like friendship, carry the bad as well as the good, because they’re real. Most readers will know the legend where Greeks youths are given in tr Greek myths aren’t just for scholars, and Phillip Simpson’s Minotaur isn’t just for kids. But this is a cool reimagining and vivid retelling of a young man’s coming of age in the time of legend. Heroes are human (but strong), and monsters… well, this monster at least is mostly human as well. Gods might make better fathers than some men. And relationships, like friendship, carry the bad as well as the good, because they’re real. Most readers will know the legend where Greeks youths are given in tribute each year, to be devoured in the labyrinth where the Minotaur lives. Perhaps they’ll recognize other names too in this novel. But readers who’ve never heard the myths will pick up the story quickly as elderly poet Ovid listens and interjects what he thinks he knows into the tale. (Ah, how nicely plotted—the old man who doesn’t know it all!) But Ast has a story to tell that’s not quite the same as the one we’ve heard, and the reader is gripped from beginning to end, eager to know more and totally absorbed in fascinating detail and delight. In our modern world, where “Truth often suffers for the sake of entertainment,” this truly entertaining novel might be wisely thought-provoking too. It’s highly recommended. A really great take on a classic Greek myth. The summary of this story is obvious: it’s a retelling of the infamous Creteian Minotaur’s life. The minotaur, Ast, meets Ovid, the famous Roman poet, and recounts the details of his life over a thousand years after the events of the labyrinth occurred. I love mythology and ancient history, and that's what drew me to this book initially. This novel was a quintessential For Want of A Nail story for me, and if you love stories from the monster's POV (think the classic Grendel), then Minotaur is go The summary of this story is obvious: it’s a retelling of the infamous Creteian Minotaur’s life. The minotaur, Ast, meets Ovid, the famous Roman poet, and recounts the details of his life over a thousand years after the events of the labyrinth occurred. I love mythology and ancient history, and that's what drew me to this book initially. This novel was a quintessential For Want of A Nail story for me, and if you love stories from the monster's POV (think the classic Grendel), then Minotaur is going to be a net positive read for you (it was for me). There's a lot of good in this novel, but the format of the retelling weighs it down and limits how connected I felt to this story at any given time. Ast retelling his life to Ovid is an interesting premise. The narrative retelling format makes sense for this story, and it lends the story a mythological feel. However, after reading a couple stories that relied on this narrative retelling format, I think there's some major draw backs in telling a story this way. Because Ast tells you a lot of things, this makes some of the other characters in the story seem under developed. Pheadra suffers the most from this, and that's a shame because it would've been a better story if I understood her more or had a better feeling of her as person. I love mythology retellings and reimaginings, but this story didn’t quite do it for me. How you feel about this retelling will likely depend on how engaged you are with Ast’s narrative voice. It’s not bad, and the style is purposefully archaic, but that does mean that it’s a bit dry. Still, I liked Ast as a character; he's a purposeful gentle giant, and his treatment during his childhood, his encounters with bandits, and his events in the labyrinth turn on the foil between Ast's appearance and his true personality. We rely on Ast for most of the story--and solely during the retellings--to form opinions on the characters. All their actions are filtered through his perspective, which causes the characters to lose a bit of their own agency and personality. At the same time, Ast is a reliable narrator, and there's no reason given why he'd be anything but honest with Ovid. In some ways, this creates a more boring story--Ast has clearly developed some emotional distance and perspective on the events of his childhood. Ovid isn’t much of a character, and that’s a shame because a more developed character could’ve helped this story. Ovid is a drunken old man with three divorces, and he serves mainly as a personality foil for Ast. There are also a lot of 'genius bonuses' for readers who know a bit about Minoan society and Greek mythology. Icarus makes an appearance; of course Theseus does, and his characterization stands out a bit stronger than most. King Minos comes across as a mustache twirling villain, but this hardly matters as the story needs a strong antagonist, and he fits that role. I wasn’t expecting to be swept away, but I was, into the port of Iraklion, Knossos, the once glorious capital of Crete. We meet the Roman poet Ovid, known for his epic poem: The Metamorphosis, on a research trip for his work-in-progress. A poet, not a historian, he visits Crete to see the fabled home of the Minotaur for himself. In the port of Iraklion, Ovid meets the largest man he’d ever seen, unshaven, hair that looked like it was chopped with a clumsy blade. He’s also his new guide into the ruins of Knossos, and into the ruins of the Labyrinth. Where Ast, otherwise known as Asterion, otherwise known as the Minotaur, the half bull and half man of Greek Mythology, begins to tell his side of the story. Was it a true story? Ovid’s scholarly quest for knowledge wins and he’s all-ears, listening to Asterion’s tale. So was I.
I was entirely compelled to hear more of his story. We learn of King Minos, Asterion’s cruel stepfather, and about his abused, but devoted mother. Deformed from birth, accused, and insulted throughout his life, a product of a God, he grew up despised by King Minos. Reminded of Asterion’s mother’s infidelity with Poseidon, the Minotaur’s real father. Asterion begins his tale, from before he was sent into the Labyrinth. He tells of his great love, with so much tenderness for a brute. But was he? There is much heartbreak, and a lot of humanity in this telling. Ovid can’t help following the stranger home and writing down every word he speaks. Even if the stranger is recounting a story that happened 1000 years ago. But it was entirely believable—for Ovid, and for me. Ovid is enraptured, and the wine keeps flowing. There are some fun twists, I realized as I looked up each Greek character. Theseus is there and we learn so much about their relationship and Asterion’s side of the story. The action scenes were fluid and entertaining, and the depth of loyalty, inspiring. I love how the book opens with the cast of characters—for those of us who need a little refresher. 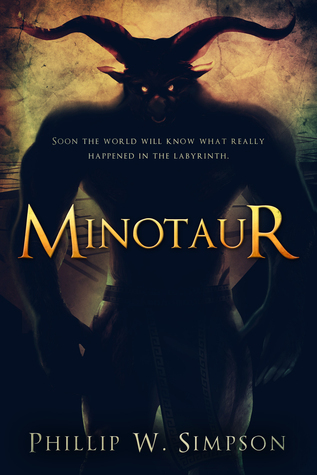 MINOTAUR is such a well-written, entertaining story, and could very well be, the true tale of the Minotaur. A great YA read! The story starts off with Ovid arriving to take a tour of the Labyrinth and surrounding area. A scholar who has written about the Minotaur and interested in learning more. Upon his arrival he is introduced to his tour guide, Ast. Ast soon reveals that he is the Minotaur in the legends and wants to tell his real story. From there we are swept away into a adventurous and at times heart breaking life of the Minotaur, his family and culture. What I enjoyed most about this book was it never ceased to The story starts off with Ovid arriving to take a tour of the Labyrinth and surrounding area. A scholar who has written about the Minotaur and interested in learning more. Upon his arrival he is introduced to his tour guide, Ast. Ast soon reveals that he is the Minotaur in the legends and wants to tell his real story. From there we are swept away into a adventurous and at times heart breaking life of the Minotaur, his family and culture. What I enjoyed most about this book was it never ceased to keep my interest. There was always something happening and pacing kept up throughout the whole story. As Ast grew up he had to endure from his family and society being harassed for his looks. As the son of a god, Ast will soon develop into a much stronger and intimidating man in his older years. After being kicked out of his home he travels with Theseus, mends a broken heart and has to survive numerous deadly situations. I was so excited when I first heard about this book - the story of the labyrinth from the Minotaur's perspective? Where has this been all my life!? I expected to enjoy this book, and I was not disappointed. I was even pleasantly surprised by the background and the history of both the Minotaur and the labyrinth! I think my favorite part of this book was how it's written. Most of it is Asterion, known to most as the Minotaur, telling Ovid abo This review and more can be found at The A P Book Club! I think my favorite part of this book was how it's written. Most of it is Asterion, known to most as the Minotaur, telling Ovid about his past and his time in the labyrinth. It's been thousands of years since the events have taken place, but Ast remembers them as if they happened yesterday. It's finally time for the world to know his story, and it was so interesting to watch him grow from a young boy into the fearsome beast of legend. There's so much more to him, and I found myself sympathizing with him on so many levels. Even though this book kind of reads like a history lesson, it's so full of adventure and romance and friendship and everything else a great fantasy book should have that I never found myself bored or wanting to skip ahead to something more exciting. It's paced just right, even with the breaks back to the present. I really enjoyed how they broke up the story to let us see Ovid's reactions to this new information. Although Ast is the most well-rounded character, his siblings and friends, and even some of the more minor characters, are still well-developed. I felt like I knew each one of them personally, and I even disliked some of them so much that I cringed whenever something went wrong because I just knew they were behind it. I was always excited to read about Ast's times with Phaedra, and it was interesting to see the real sides of Theseus. He's a hero with a dark side, and that's not something I've really seen before in any of the stories about him. This book is just incredibly well written, and I would definitely recommend it to anyone who wants to read a YA take on the story of the Minotaur. It's engaging, exciting, and will leave you wanting more! I love when I come across a book that challenges and recreates classic myths, and this one definitely exceeded all of my expectations. 4/5! I enjoyed the voice and tone of this story, it reminded me of an ancient orator sharing his story. I found the characters believable and real. I liked how the author used famous characters from historical myths but stayed true to their characters (for the most part) and gave them depth. Of course, the author spun some of the relationships in his own way and the Minotaur is not the monster everyone thinks he is, but I enjoyed the way the author played it out. The pacing isn't bad, but if you're im I enjoyed the voice and tone of this story, it reminded me of an ancient orator sharing his story. I found the characters believable and real. I liked how the author used famous characters from historical myths but stayed true to their characters (for the most part) and gave them depth. Of course, the author spun some of the relationships in his own way and the Minotaur is not the monster everyone thinks he is, but I enjoyed the way the author played it out. The pacing isn't bad, but if you're impatient for action then this story may seem to drag out for you. If you look for it, there is a lot of telling but mostly because Asterion (the Minotaur) is telling his story. It wasn't too bad for me but I did find myself skimming ahead sometimes to get to the important bits. When Ast is telling his story there are breaks in the story for his reality that pulls me out of his story because that is part of the story. It's fine for the most part, but I wasn't extremely fond of it as a reader. Can't say that I really liked Ovid too much, seemed like too much of a drunk to be taken seriously but I suppose that was the norm in those times. He might have been comic relief but I didn't feel him to be that funny. The story is entertaining. I found myself immersed in Ast's tale and what he went through in his life. I found myself relating and sympathizing with him during his journey and I think he led an interesting life. If you're looking for a humorous read or a romantic story, you won't really find it here. It's mostly a discovery and adventure story where Ast is trying to find himself and his purpose in life. I recommend this story if you enjoy seeing historical myths and their heroes come to life. You'll find an adventure here. 3.5 out of 5 rating for me! Legends and myths contain nuggets of truth, oft buried beneath the detritus of time, layer upon layer added until sometimes what is has become distorted reflection of what was. With Minotaur, Simpson has given us just such a story of what might have been. Not the chimeric creature of legend, half human and half bull, he who would become known as ‘Minotaur’ is simply a young man who had the misfortune of being born with an unfortunate birth oddity. Long after the events surrounding the labyrinth, and long after Knossos has crumbled to ruin and faded to tattered memory, the demi-deity Asterion tells the true story of his life, and those events, to the poet Ovid. Asterion, though big and strong, is an undeniably gentle soul. Despite a childhood of abuse and neglect, he manages to preserve that nature, instead of growing bitter or vicious. He is easy to identify with, especially if you've had the displeasure of being singled out and mocked for being ‘different’. Simpson has woven a captivating tale that presents a different take on not one, but several Greek myths and legends, and the players within. Demi-deity status notwithstanding, it is easy to believe this is the nugget of truth behind the myth of the minotaur. If you enjoy Greek mythology or alternate histories, or you just want an enjoyable read, you’ll definitely want to check this nifty novel out. This was a very interesting book with a great story line. I liked Asterion, the Minotaur. He was very good. I liked Phaedra, whom he loved and she he. I loved his mother's name: Pasiphae. It has a beautiful ring much like the person. Theseus was interesting and good for Ast. What a tragedy to have horns for Ast. Luckily Daedalus and Icarus helped out in the end. Minos seems like a little boy who needs to grow up but has an army at his command. He was so cruel and wicked. Luckily, Poseidon comes This was a very interesting book with a great story line. I liked Asterion, the Minotaur. He was very good. I liked Phaedra, whom he loved and she he. I loved his mother's name: Pasiphae. It has a beautiful ring much like the person. Theseus was interesting and good for Ast. What a tragedy to have horns for Ast. Luckily Daedalus and Icarus helped out in the end. Minos seems like a little boy who needs to grow up but has an army at his command. He was so cruel and wicked. Luckily, Poseidon comes to Ast's rescue. It makes one wonder how many people are put to death by rulers. I was so grateful for Phaedra's love and devotion to Asterion. It was so strong. If I was to sum up this book in one word I'd use simple. That's not to say of course I didn't enjoy the read through because my rating would be a whole lot lower if I didn't. But just about everything in this book could be described as simple for me. Whether or not that's a good or bad thing is dependent entirely on the individual. For me, however, it was more negative than it was positive. The writing felt like it fit more into middle-grade than it did young adult with its simplistic descriptions If I was to sum up this book in one word I'd use simple. For me, however, it was more negative than it was positive. The writing felt like it fit more into middle-grade than it did young adult with its simplistic descriptions of the ancient setting and the characters themselves were rather simple in personality. I've always loved Greek mythology and you can only imagine my excitement when I won the book in a goodreads' giveway. And my expectations that this would be a great book were not only met but exceeded. I normally don’t read Greek & Roman Mythology books, so I gave it a try. I read the first three chapters and I really liked it and kept reading all the way to the tenth chapter. Then on the next day I read all the way through end of the chapter. I really like Ast’s character and Ovid too and also Phaedra too. It’s really easy to understand what it’s about. I really like the way Phillip writes a very smooth, fairy tales & myths. Phillip W. Simpson is the author of many novels, chapter books and other stories for children. His publishers include Macmillan, Penguin, Pearson, Cengage, Raintree and Oxford University Press. He received his undergraduate degree in Ancient History and Archaeology, his Masters (Hons) degree in Archaeology and his Masters (Hons) degree in Creative Writing from the University of Auckland. He is cur Phillip W. Simpson is the author of many novels, chapter books and other stories for children. His publishers include Macmillan, Penguin, Pearson, Cengage, Raintree and Oxford University Press. He received his undergraduate degree in Ancient History and Archaeology, his Masters (Hons) degree in Archaeology and his Masters (Hons) degree in Creative Writing from the University of Auckland. He is currently working towards his Doctorate in Education, focusing on teaching children's creative writing. Before embarking on his writing career, he joined the army as an officer cadet, owned a comic shop and worked in recruitment in both the UK and Australia. His first young adult novel, Rapture (Rapture Trilogy #1), was shortlisted for the Sir Julius Vogel Awards for best Youth novel in 2012. He is represented by Vicki Marsdon at Wordlink literary agency. When not writing, he works as a school teacher. Phillip lives and writes in Auckland, New Zealand with his wife Rose, their son, Jack and their two border terriers, Whiskey and Raffles. He loves fishing, reading, movies, football (soccer) and single malt Whiskeys.